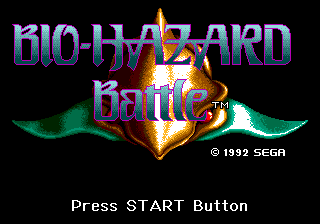 Bio-Hazard Battle, known as Crying: Aseimei Sensou (クライング 亜生命戦争) in Japan, is a 1992 shoot-'em-up game by Sega for the Sega Mega Drive. The planet Avaron (Avalon on the Japanese box... reverse Engrish, incredible) was plunged into deep biological war, and a retrovirus was synthesized to try to defeat the enemy. Unfortunately, the plan backfires: the planet is rendered nearly inhospitable, and the only survivors of the virus are sent to space to await a time when the new species of creatures that survive or thrive on the virus pose little enough a threat to set up a new colony. The game's stages display the virus outbreak, e.g. stage 2 is a ravaged city, stage 7 appears to be the facility where the virus was produced. According to the game's credits, ray tracing was used to create some graphics. There are four bio-ships available to pilot. Tap any button to fire normal shots, and hold/release a button to fire a charge shot. There are a number of different normal shots, represented by powerup colors; strangely, normal shot types are partially shared between certain ships. Each ship has its own unique charge shot. A miniature ship circles around the bio-ship that not only fires its own shots in time with the bio-ship, but also can collect upgrades to its current weapon and can be used as a shield, absorbing enemy bullets before they can hit the bio-ship. This happens to be one of those games where touching walls does not harm you. Extra lives are given out based on score. Most stages also have extra lives in hidden spots; reveal by shooting. Green: The only weapon shared by every ship. A general purpose spreadshot and the default weapon of each ship. Red: Either a red homing laser, or red rings that are reflected on contact. Blue: Either a cross shaped laser, or slow homing orbs that can destroy enemy bullets. Yellow: Either a rapid fire cannon, or a straight laser that can also destroy enemy bullets. Various cheat sites claim there is a secret stage resembling an asteroid field. However, such an stage never existed. Main article: Bio-Hazard Battle/Magazine articles.